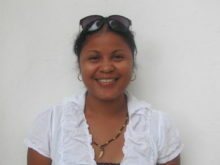 Manuela Garcia Pú became a GOJoven Fellow at age 28. As a Mayan woman, Manuela worked within ASECSA’s advocacy program focusing on gender policy and advocacy, both at the national level and within the organization. Prior to coming to ASECSA, she trained young Mayan women who work as domestic servants in Guatemala about their reproductive and sexual health and rights. She is interested in expanding ASECSA’s focus on adolescent reproductive health, both at the policy and programmatic levels. Manuela recently finished her studies in Social Work and recently returned from Spain with her Master’s Degree.